Gartner predicts worldwide IT spending to total US$3.76 trillion in 2019, or an increase of 3.2 percent from 2018. In New Zealand, this market is forecast to reach NZ$13.5 billion this year, an increase of 2.6 percent from 2018, growing to $13.9 billion in 2020. The latest quarterly technology spending forecast data from Gartner also sees a much higher growth rate in Australia, where spending on technology products and services is tipped to reach A$93.3 billion this year. This is an increase of 3.4 per cent from 2018, and expected to reach more than A$97 billion in 2020. Despite uncertainty fueled by recession rumours, Brexit, and trade wars and tariffs, the likely scenario for IT spending in 2019 is growth,” says John-David Lovelock, research vice president at Gartner. “However, there are a lot of dynamic changes happening in regards to which segments will be driving growth in the future. Spending is moving from saturated segments such as mobile phones, PCs and on-premises data centre infrastructure to cloud services and Internet of Things (IoT) devices. “IoT devices, in particular, are starting to pick up the slack from devices,” he adds. 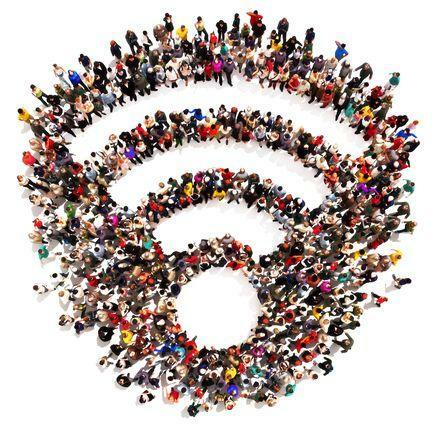 “Where the devices segment is saturated, IoT is not. 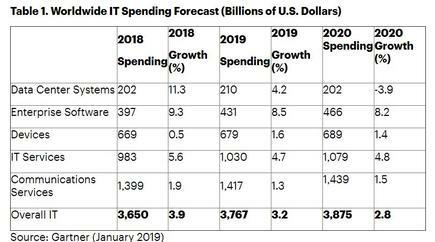 With the shift to cloud, a key driver of IT spending, enterprise software will continue to exhibit strong growth, with worldwide software spending projected to grow 8.5 percent in 2019. It will grow another 8.2 percent in 2020 to total $466 billion, says Gartner. Organisations are expected to increase spending on enterprise application software in 2018, with more of the budget shifting to software as a service (SaaS). Despite a slowdown in the mobile phone market, Gartner believes the devices segment is expected to grow 1.6 percent in 2019. The largest and most highly saturated smartphone markets, such as China, United States and Western Europe, are driven by replacement cycles. With Samsung facing challenges bringing well-differentiated premium smartphones to market and Apple’s high price-to-value benefits for its flagship smartphones, consumers kept their current phones and drove the mobile phone market down 1.2 percent last year. “In addition to buying behavior changes, we are also seeing skills of internal staff beginning to lag as organisations adopt new technologies, such as IoT devices, to drive digital business,” says Lovelock.